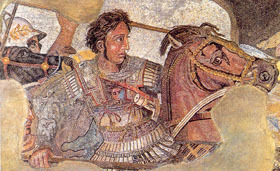 1: Where was Alexander the Great born? 2: Aleander the Great was the son of which famous Macedonian King? 3: Which Greek philosopher was the tutor of Alexander the Great in his youth? 4: Which Achaemenid king ruled Persia at the time Of Alexander's invasion? 5: Which Greek Deity did Alexander make a sacrifice to when he arrived at Troy? 6: This image depicts Alexander the Great at which battle? 7: The modern city of Herat in Afghanistan was founded by Alexander the Great as�. 8: Which island city did Alexander the Great succesfully conquer by building a causeway connecting the island to the mainland? 9: In which city did Alexander the Great die? 10: Which of Alexander's generals started the dynasty that would rule Egypt from Alexandria?